Each year, with a few exceptions, we've tried our best to take an Easter snapshot of the family. 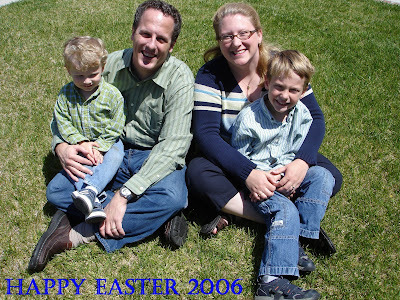 Here's a look back over the last nine years of Easter fun. This is Nathan's first Easter, at 5 months old. We were living in Japan at the time. Each of the grandparents sent him a bunny. We trekked nearly two hours on four trains and a bus to go to an English speaking church in Tokyo for Easter service. They kindly put Nathan in the baby nursery there so he wouldn't disrupt the service. It was the first time I'd ever been separated from him, and we didn't know anyone there. I was nervous. They gave us a number and said that if he needed anything, they would flash his number on the screen. I spent the entire service fretting and worrying. Inevitably they flashed his number, and I did not calmly walk out of the service, I ran at top speed, the program and inserts I had been gripping floating behind in my wake, people's heads getting whiplash as they watched the wild woman run out the door. He was fine, just hungry! Somehow we missed 2002. This is 2003, and Nathan is two and a half. It is not the most flattering photo, but I love it. 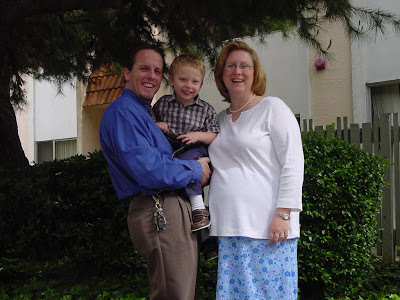 We were living in Fremont, CA and I was pregnant with Benjamin and look like I have an Easter egg for a belly! I had some complications requiring a lot of bed rest, so this was a rare fun treat to go out as a family and celebrate. 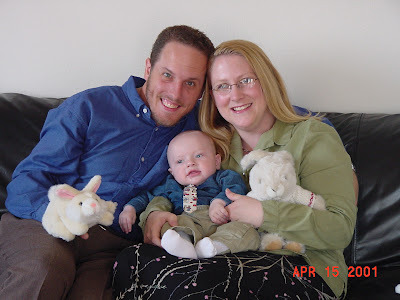 2004 and Benjamin's first Easter. He's so round and rolly and happy! This is at our house in Lomita, CA where we lived for a year. 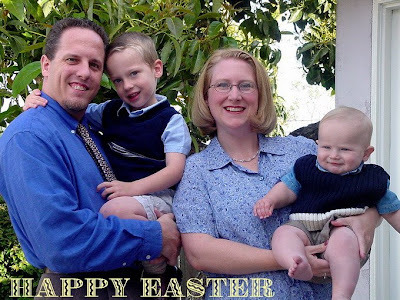 We crossed the International Dateline on Easter of 2005 while flying on our way to our new home in Hong Kong, so we completely missed the holiday that year! 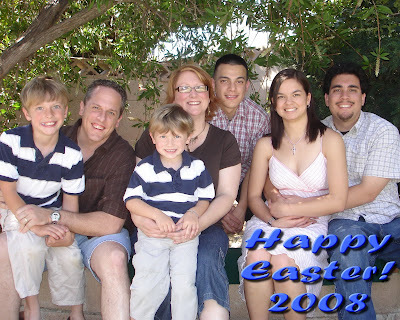 Easter 2006, back in the USA! One or all of us were sick, I think a single photo on the lawn was all we could manage! 2008, last year! Our family nearly doubled that year when we forced Tommy, Alyssa, and Chris to get in the family photo. Michael made his world famous BBQ beef ribs to make the day extra special!